Sew Expo and a Workshop with Stephanie Kimura!! I know I’ve been AWOL for a month and a half, but I’ve been so busy trying to grow my business, and getting to do a workshop with author and designer Stephanie Kimura (a really delightful woman! ), and teaching and getting ready to teach a half-day class at Sew Expo in Novi, MI at the end of September (on the subject of 3-D Quilting Techniques!! ), AND studying for my LSAT exams! That’s right… in addition to all the sewing and design stuff I’m doing (and will continue to do), I am applying for law school – with the intent of learning art-related law (intellectual property and small business) so I can help more artists! I decided I could make a throw blanket for the couch – always seem to be in short supply (Why? We have enough blankets. Is there some kind of couch monster that eats them? Why do I never have one handy when I’m cold???). Which left me with a usable area that was only about 5″ x 7″… Really wanted the whole sample…without the paper…. I was really crushing on that plaid wool…. So I searched the internet for tips, and found that the paper backing MIGHT come off if I ironed it – get it hot enough to melt or just loosen the glue…. Here are two – you can see the amount of variance! Laid them all out on my design table, and then quickly sewed everything together. Then I decided (why?!) that I should try FELTING the blanket – make the blanket a little fluffier and less crisp and flat, and also would help remove the paper and glue remains on the backs. So, tossed the whole thing in the washer (recommend doing this with tennis balls, I couldn’t FIND my special already-dead washing machine tennis balls, and while my awesome husband volunteered to go buy more in the middle of the night (I WANTED IT NOW!!! ), I declined and washed it without… ), ran it through on extra-hot, extra-agitation, extra rinse cycle, and then dried it. My husband finally confessed that it was a little too rustic/homespun for his taste, but I love the colors (and the wool! and the PLAID!! )… So, the next time you find one of those books, think about what you can do with them, don’t just walk away from it!! Have you ever made something from one of those? Or from upholstery samples in general? I’d love to see it! A Return to Subject – My Office! FINALLY, we are getting back to the original point of this – my adventures in art! One of the HUGE frustrations with the house has been my business offices and warehousing rooms. When we first bought the house, I decided my main office MUST have a color change and a mural (hand-painted by me of course – because I have SO much free time and energy….NOT! ), and my sewing studio was so hideously painted I really had no choice but to redo it. My space for my Beautiful Textiles business had a mocked-up cutting table which was less than ideal and was slowly killing me. After a YEAR of being mostly sick and not working on anything, the mural in the office is finally officially half done! Hope to have the other half done this week… Husband helped me put up trim last weekend. Originally, I’d planned on painting faux wainscotting panels on the wall, but now we are undecided so I think I will just leave the bottom half of the wall plain for now, and live with it a little and see what I want to do. I was planning out my sparser version, when I stumbled on this FABULOUS hand-painted De Gournay silk wallpaper…. That was it. I was SO in love! 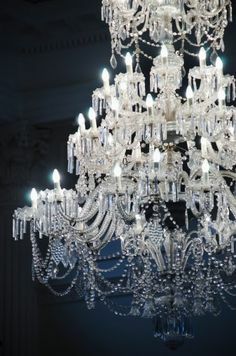 It was sparse, but not cold, elegant and beautiful, and…. so unbelievably expensive it wasn’t even in the realm of my reality. So I found the best photo of the design I could (which wasn’t much back then – a blurry, rough design sketch. Looking things up to write this, I find there are now MUCH better pictures now available! Oh well…), and used that as my reference to do my painting (Bonus – very few birds or other creatures!). I decided on a fairly monochromatic color scheme to enhance the elegant simplicity I was going for, and went with metallic silver branches, with white blossoms (the same white as the bottom part of the wall), and purple centers (the same as the top part). Our walls repeatedly rejected paint, so we finally hired someone to do the base coat. I think they were VERY sorry for the low price they’d quoted for such a “simple job”. It took him about 6 coats of paint, 2 different brands, before we ended up with our base coat! I drew a line around the wall where the chair rail trim would go, and told him not to worry about getting it neat there, just paint the top part purple and the bottom white. Then we dithered about white chair rail or dark wood that almost exactly matched the existing trim…. So, there you have it… I’m not going to put De Gournay out of business, but I like it (well mostly… Like most artists, I hate a lot of my work and critique it endlessly. I should probably go to therapy about this, but then I wouldn’t have any hobbies…But remember, this is about GOOD ENOUGH…), and I can’t wait for it to be finished and then to start unpacking and furnishing the room…. PLEASE DO NOT USE OR REPOST ANY OF THESE IMAGES WITHOUT PROPER CREDIT AND LINK-BACK!! Thank you! I know I haven’t posted in a couple months. I spent half of January visiting the wonderful textile markets of LA, and friends in Seattle, came back in Feb. with the flu and spent the rest of the month in bed, exhausted. I’m feeling creatively stifled and desperate to make something and break out of this ‘being sick’ cloud. To that end, I’ve been frantically combing through Pinterest trying to find some little thing to jumpstart me and get me going, and I have to say, I’M SO FRUSTRATED with what I find!! I have complained about this before, but I honestly don’t understand how some of these people become so popular! The Impossible Score: The entire project hinges on this one incredibly fabulous piece they ‘happened’ to score for $5 at the local flea market/thrift store/craigslist, but that none of us will ever find – let alone for $5! The Non-Tutorial: They include ‘tutorials’ which actually somehow take up an entire page with pictures and text and yet have no actual instructions or information on how to copy the look. The Partial Tutorial: “We painted this filing cabinet with Benjamin Moore paint in Petal Pink.” Sounds helpful, doesn’t it? But no information on how they prepped the cabinet to take the paint (painting a metal filing cabinet is NOT like painting your wall! ), or on how they removed the embedded hardware to repaint that. The Budget Makeover: This often uses the Impossible Score and the Non-Tutorial as part of it, but the other part is that one person’s budget is another’s luxury. One ‘designer’ talked about how she sold the entire contents of her apartment in just 6 days on Craigslist (I can’t even get people to reliably pick up high-demand items in less than 6 days! And to sell them that fast, they were probably priced fairly cheaply. ), then redid her entire apartment with a really small budget – starting with the small $300 used rug, custom flooring in other rooms, custom furniture (no mention of how much those were). Bonus point for me? The before and after photos of the apartment were identical! Same color schemes, same furniture styles, it just looked like a minor rearrangement of decorations and small furniture. But remember, YOU, TOO, CAN HAVE THIS SAME LOOK!!! Do you find these problems too? What drives you crazy about these blogs and Pinterest boards? Gosh, I know I’ve been so bad at keeping this updated! It seems like I wake up, do the bare minimum to keep my business and life running, and suddenly it’s 1am and bedtime! Every day feels like nothing got done, but I know that isn’t true and vast amounts of unpacking, settling in, organizing, and LIVING are happening. ONE OF MY JACKETS WAS FEATURED ON TELEVISION! On a local morning talk show, to be precise! That was tremendously exciting, and I only found out about it the night before! They’d seen my work in one of the galleries I show in here, and decided to grab it! Also, have been asked to teach several workshops, some open to the public, some not. So if you are local, or visiting the Greater Detroit area and you’re a member of ASG, I will be doing 3D Quilting in March and Velvet Embossing in May for 2 different local chapters. You are welcome to come join. Hung up 2 large lanterns filled with twinkle lights and ornaments… 1 at the end of the drive, 1 on the front porch by the door. I decorated the wreath myself! (Very proud of my first attempt 😉 ) – this is hung by the garage door we use most. My husband decided this wasn’t enough, so he wrapped ME in lights and planted me on the porch. We are not amused…. AND, I’ve spent the past month baking up a storm!!! Husband waited (3 times!) until the last minute to ask me to make something for the company bake sale fundraiser for Toys for Tots, then there was the company potluck, then he wanted something to bring as a present for colleagues, then he ambushes me with a demand for more (he miscounted), PLUS could I make a special batch for one person who is gluten-free (well, his diet is). Ok, that was actually more like 5 times, wasn’t it? So I bought a ton of the mini-loaf pans (Bed, Bath, and Beyond has a set of 4 for $10, don’t forget your coupon!) and an average cake recipe divides neatly into 4 minis! Yay math! Topped with the frosted cranberries from Life, Love, and Sugar (which were awesomely good!). We don’t like white chocolate, so I skipped that part of the LLS recipe, and found that without it the cake was ok – very dense and heavy, but we preferred the lighter, more open crumb of the CMC recipe. For the gluten-free recipe, I found this recipe from Martha Stewart which really did come out quite well!! I used the gluten-free flour blend from Krusteaz that was available at my Kroger grocery. I found a super handy trick for using mini-loaf pans, that surely will work just as well with almost any pan… Use a strip of parchment paper (does not have to full cover the bottom of the pan, can be less than half the pan in width) to line the pan first, pour your batter on top of this, and then gently pull the tabs of paper up to release the baked cake! I’ve seen recipes that call for lining the pans, but never suggesting just a little strip. It makes all the difference in the world! Those little cakes popped right out, neat as could be. Any batter that had stuck to the paper and burnt on could just be brushed off gently and did not adhere to the cake, and all the little cakes (I made about 50 mini and full size cakes this month, and have a request for another 2 dozen!) came out beautifully! Happy holidays, everyone!!! Wishing you all a year full of joy, health, happiness, friendship, peace, and love! Spent the past week visiting the in-laws and ended up spending most of it repainting Grandma’s bedroom. Had a lot of fun faux finishing it. 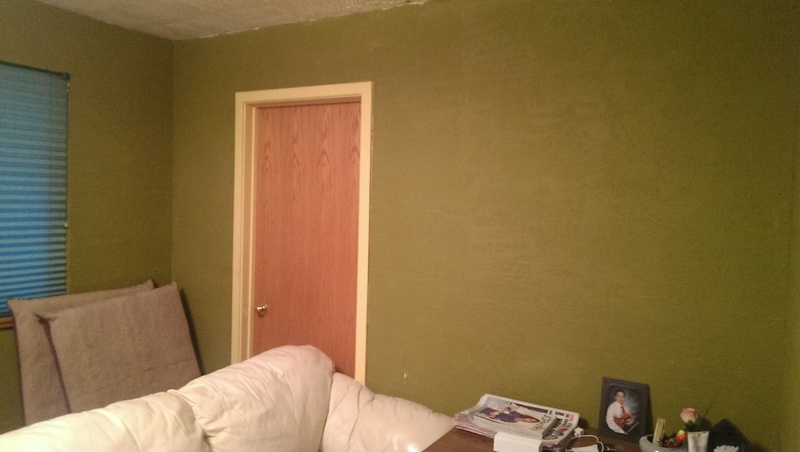 This was definitely an example of Good Enough…the paint store told me that no matter what I used, I wouldn’t be able to cover the dark green with one coat of anything – even paint and primer in one. Not only did we cover the green (with pale orchid!) in one coat, but the edge at the ceiling and floor couldn’t be perfectly done (previous painters had smeared some of the dark green on the ceiling, couldn’t cover that), but on the next visit we will put up crown moulding and maybe rip up the old stained carpet and lay some wood floors and put on a nice baseboard, repaint the ceiling and trim… This will totally do her for the year until we go out again and finish the job. Grandma’s room before – the photo cannot begin to capture how dark and depressing this color really was. Darkest army green, that sucked up all the light in the room and made it look like a miserable troll cave. Poor grandma…. Grandma’s room after… I repainted it this lovely soft orchid color, and then sponged cream and gold over it, relayering the orchid over it where the cream was too heavy. 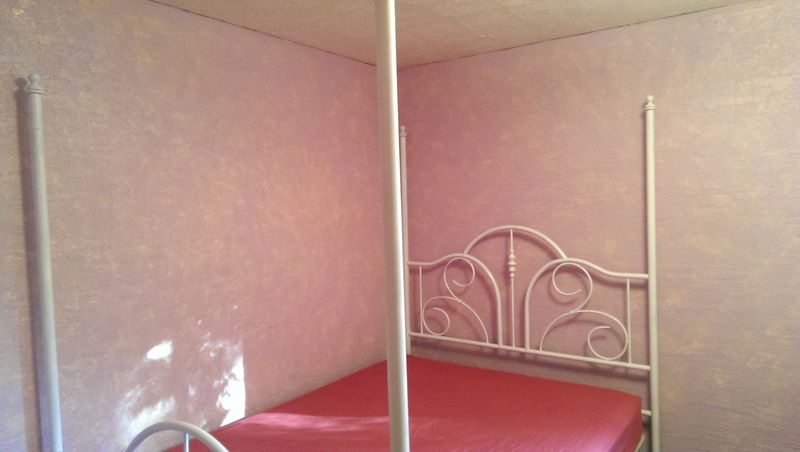 I also found the bedframe (before she had none – just the bed with no frame) and repainted that too in gloss white. So much nicer!! Which room in your house do you want to redo and why?